A new component has been added to the Example Components & Developer Resources (All Versions) download section. 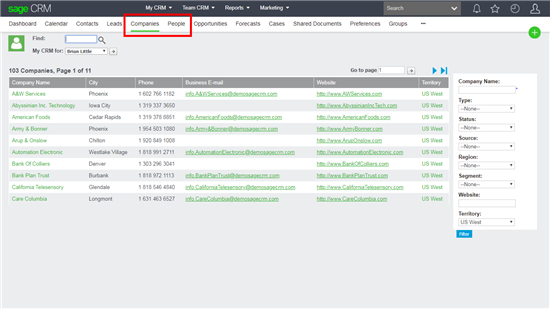 The new component will add two new tabs to the My CRM menu. The tabs will display the Companies and People assigned to the logged on user. Nice add, very timely for something we had started working on. I assume we can modify the columns and filters as usual? Yes. These can be changed. To keep the component as small as possible I used the existing Company and Person lists and screens. Because they are reused items you would need to think about what was changed. But if this is a useful feature then left me know how you want this enhanced and I will add 'update' the component. Hi Jeff, this is an excellent component and sorts me out on a particular request for a new implementation. However, they would like the same for Team CRM. Would you be able to provide one for this please. I have updated the component to allow it to be called from the context of the Team menu. This would be a great feature to add to stock installations. How are "People" and "Contacts" (existing) different? The Contact tab display contacts that are synched backwards and forwards with Exchange. This people tab displays people for which this user is the assigned user (account manager) and for which they have rights. Can I change the label of the Company tab once it is added in the system? Yes. This is just a standard change to the Tabs in the Customization screens.